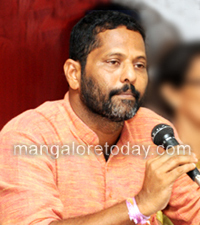 Mangaluru, June 11, 2017: A complaint has been lodged at the Kankanady Rural Police Station against BJP Minority Morcha leader Franklin Monteiro and Oswald D’Cunha on the charges of abusing and threatening Fr Andrew D’Souza, Parish Priest of St. Lawrence Church of Bondel. The incident had occurred after Franklin who also happens to be the President of Rashtriyavadi Kristara Vedike had organised a noisy protest by the Vedike against cattle slaughter even as the Church mass was underway. Even as the hundreds of faithful who had attended the mass rebuked the protestors for disturbing the mass, the latter alleged that the church as well as the community leaders had failed to support them. It is also alleged that Franklin had barged into the church office and began hurling abuses against the Parish Priest.